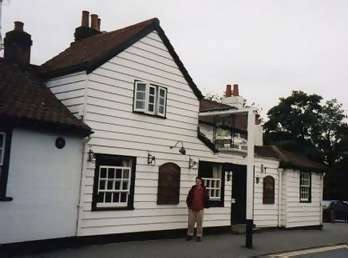 A lovely old weather-boarded pub that I visited during the summer of 1999. It's a 16th century Grade II listed building situated a few yards from the River Thames and close to the A317. The Old Crown struck me as a very friendly pub. We only went in the public bar with a very long bar and lots of friendly locals drinking the very well-kept range of real ales that they have on offer. These usually include Courage Directors and Youngs Special as well as a guest beer or two which might be from the local Alchemy brewery. Not quite sure why the pub hasn't appeared in the Good Beer Guide for a few years? There are in fact several rooms in the pub with two other bars each with its own distinct atmosphere. They also serve good home-cooked food available both at lunchtimes and during the evening. They've also a pleasant garden to the side of the pub where you can enjoy a quiet pint outside whilst glimpsing at the River Thames. The pub now has its own website.